The traffic moves relentlessly through Sallins on Saturdays, as it does most days; its progress halted only temporarily by the traffic lights at the canal bridge and at the entrance to the Lidl supermarket. But there were longer delays this afternoon as a silent march, in memory of teenager Dane Loakman who died following a road accident at Clane Road almost a year ago, took place bringing the flow of vehicles to a reflective halt. People of all ages, including children in buggies and family groups, took part. Some wore Sallins GAA tops, others arrived wearing the gear of the local soccer club. 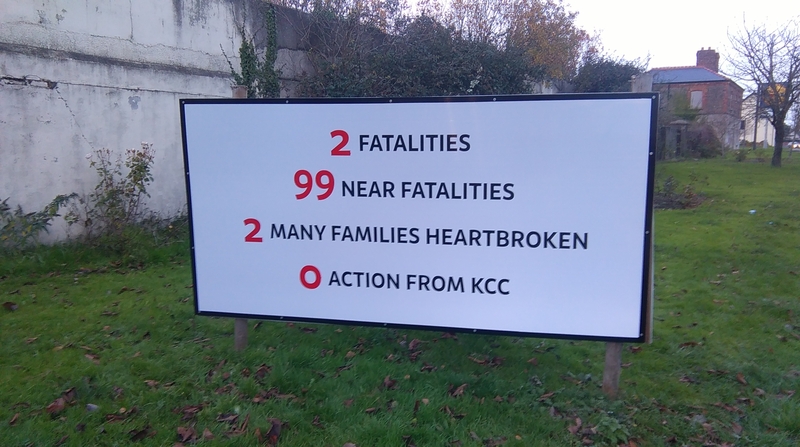 The organisers, Sallins Community Council, had set up a table at Castlefen, close to Dean’s home, where people could collect high viz jackets provided by the Road Safety Authority. There weren’t enough for the number who turned up. Perhaps 1,000 people took part, starting out from the entrance to Castlefen where the traffic was managed by Gda. Ronan Mannion, a member of Naas-based roads policing unit. They proceeded, some holding candles, in the fading light to the entrance to The Waterways and back again. SCC chair Fergus Carpenter said those present were there to remember Dane and to support his mother Alison and brother Codey. “The loss of a child has to be among the very worst things a family can suffer. By your presence here you’re remembering him and the McLoughlin family who suffered a similar bereavement previously,” said Mr. Carpenter. He also said the community was thinking of the family whose mother was injured when struck by a car while walking in Sallins in a more recent accident. “We don’t want any more deaths or injuries and we’re working to get improvements which will make the roads, footpaths and junctions in Sallins safer,” said Mr. Carpenter. Referring to improvements put forward by Kildare County Council on Tuesday last, which include significantly larger signs on the Clane side of the town as well as signs advising drivers of their approach speed, he said more is needed.